THE PHILOSOPHY - Social Justice leads to Development. 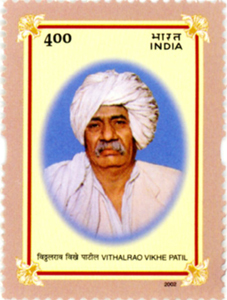 Dr. Vitthalrao Vikhe Patil - the founder of PRAVARA MEDIAL TRUST - the Parent body of this DEEMED UNIVERSITY was one such visionary. Born in the drought prone district of Ahmednagar in Maharashtra (Western India) in an ordinary peasant family, he was deeply moved by the pathetic condition of the rural masses. But he was also aware of the immense wealth of resources latent within the humble rural people, which could be tapped to combat poverty, illiteracy, disease and inertia among the rural masses. He had made a decision. He had decided to lead from the front. His lack of formal education did not deter him from his chosen path. With his untiring efforts and the unflinching support from stalwarts like Shri. Vaikunthbhai Mehta as well as Shri. D.R.Gadgil, the first industrial co-operative venture in Asia namely Pravara Cooperative Sugar Factory (1949) was started. The spectrum of this movement is being carried ahead by Dr. Vitthalrao Vikhe Patil's worthy son, Dr. Balasaheb Vikhe Patil, Padma bhushan Awaredee , with hard work and dedication. What started as a small step in 1949, soon developed into an approach that has since been widely recognized as The Pravara Model of Integrated Rural Development and won national and international accolades. The immense potential of this model was recognized and appreciated by Pandit Jawaharlal Nehru as early as in the year 1961 during his visit to Pravaranagar.